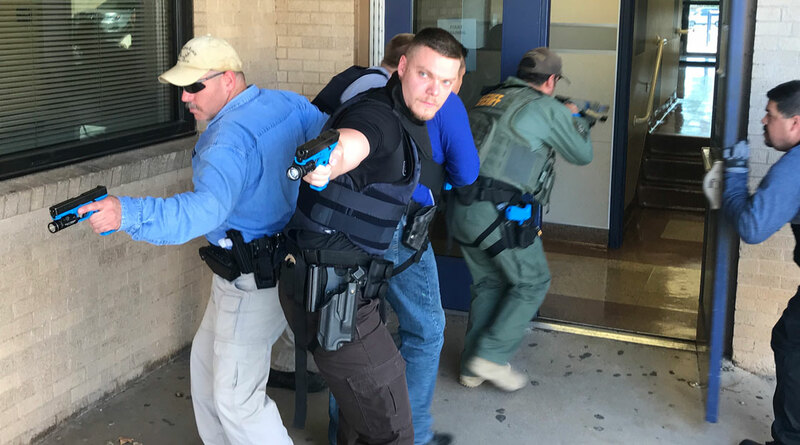 SAN ANGELO, TX — Today, at Lee Middle School, San Angelo Independent School District and local law enforcement agencies partnered together to conduct an active shooter training drill. 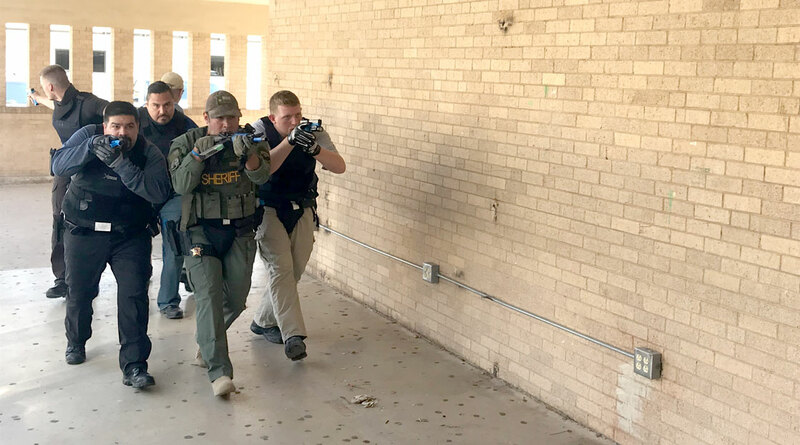 Angelo State University Police Department, San Angelo Police Department, and Tom Green County Sheriff’s Department were present and participating in the training. The training took place at Lee Middle School at 2500 Sherwood Way. A large number of emergency vehicles were parked on the right side of the building during the training on Childress St. 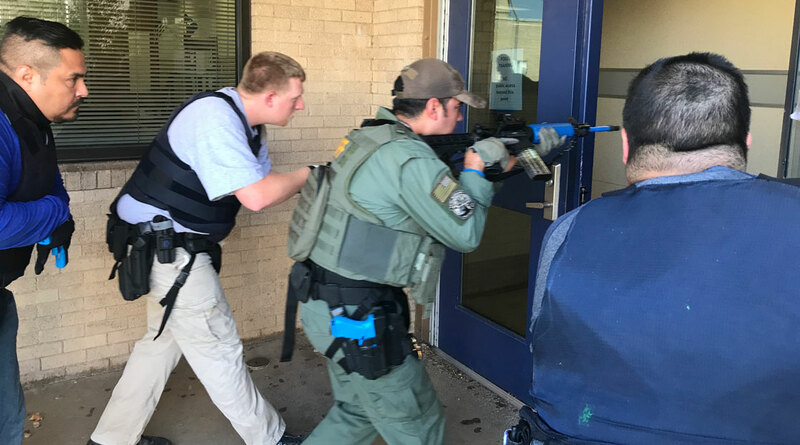 The training will likely last until later in the afternoon, as law enforcement run through many active shooter scenarios. The training exercise is being run by certified ALERRT instructors from the Texas Tech Police Department. Advanced Law Enforcement Rapid Response Training Center was created at Texas State University in 2002. The FBI named ALERRT at Texas State the National Standard in Active Shooter Response Training in 2013. The ALERRT training does not allow public attendance to preserve the integrity of the weapons and tactics used. Honestly, I'm unimpressed... I just can't stand the idea that we've chosen not to do any better than just "react" to a situation. Unless we choose to fight these issue's proactively, we'll continue to see school shooting's... Can't we do better than call some agencies and wait for their team to assemble and shoot the shooter? Are we scared to put metal detector's in our school's, and lock their doors? For God's sake people, Sitel employee's have better security than our kids do currently, and it's all to protect financial assets, not live's. Put some qualified vet's inside a controlled school environment, and allow Texan's to carry when going to and fro, and when working in school and see who want's to try it. Our banks and businesses have better security than our schools... Don't believe me? I don't need to post a link for this one... Just go and see for yourself. Glenn needs this more than anywhere. I had a sit down with the assistant principal because I was concerned about the schools layout. It is a large circle with NO windows, and only a front and back entranceway. I asked what if there was a plan and he responded "barely ", then proceeded to tell me that the current plan is to lock the sturdy windowless doors to the classrooms then stick ruler sized red laminated paper under the doors to (and this blew my mind) signal that the room is locked down..... We were both stymied. But my concerns were shrugged off with the ease of a doctor. My point is that two individuals with the will to can own that entire campus. But the police got to play army at Lee. Money is the root of all evil! Are you kidding me? Your user name suggest's that we are all the "sheep", yet you want us to just accept a "responsive" countermeasure, rather than "proactive" solution's? You may need to change that to "I-M Sheep". When we seek to do nothing more than "respond" after life has been taken, and our banks and businesses have more proactive "preventative" measure's in place, than we are willing to figure out and set up for the live's of our children... That's sheepish. Honestly, it doesn't even affect me because my kids will never go to one of the school's here, but I still care about all the kids who do go. It's not exactly teaching them that they are the most important when "money" gets better security than they do.